Paperwork relating to Flight Sergeant William E Richards RAFVR who flew with 100 squadron as a Navigator. He undertook a 6 month full time course under the Air Ministry Preliminary Air Cew Training Scheme at Borough Polytechnic, London in September 1943, obtaining a distinction in maths, mechanical drawing and geography. Included in the lot are various exam question papers and his certificate. There are also a couple of his handwritten RAF notebooks and Air Pamphlet 145 'You are going to be a Navigator' dated 11/42. His navigator's Log Book cover (1942 print date) contains sheets/notes on navigation, a plotting map used for training and a couple of detailed Navigator's log sheets filled out on training flights in Canada c.1942. His service and release book also has a medal slip within, issued at 100 Squadron orderly room in March 1946. He was entitled to the 1939-45, France and Germany, Defence and war medals. 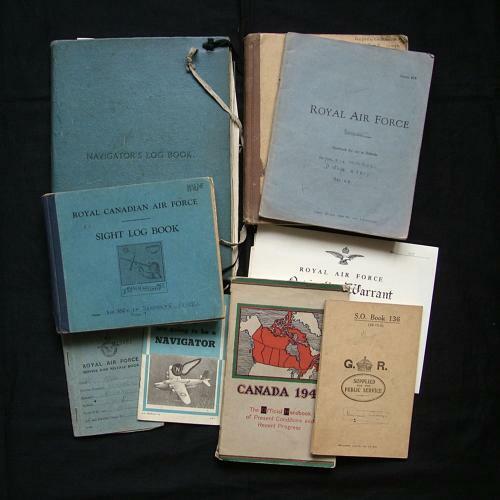 Other items include 'Canada 1943 - The Official Handbook of Present Conditions and Recent Progress', his RAF Navigation Warrant 2nd class certificate dated December 1946 and a couple of very nicely drawn pen and ink sketches featuring RAF 'types'. Finally there is a sheet with the lyrics to 'The 100 Squadron Boys' song! An interesting group. Used condition. Stock code P23445.